Fatigue is one of the main problems I help clients overcome. If you need to eliminate the desire to crawl under your desk and nap in the afternoon, or if you just want to boost your energy and productivity, listen up. I’ve got some tips to share with you. First off, a good breakfast is essential. What you eat for your first meal (which should be within an hour of waking up, NOT lunch) determines how you’ll feel for the rest of the day. Pastry and coffee? Afternoon snooze-fest. Chicken apple sausage with greens and avocado, green tea on the side? Eggs scrambled with veggies? Raring to go. Click here for a list of energy-boosting and energy-zapping breakfasts. 2) Green tea. A cup can really perk you up after lunch ad may help stave off sugar cravings. I drink a cup in the morning, mid-morning and mid-afternoon. Green tea has so many benefits, from boosting metabolism to preventing cavities. If you have trouble falling asleep, don’t drink it after 2pm. 3) Coconut oil. Boosts metabolism, effective against bacteria and viruses, AND boosts energy due to its medium chain fatty acids. Is there anything coconut oil can’t do? Take 1 tbsp daily, or use in therapeutic treats like these maca root truffles, which also satisfy afternoon sugar cravings AND maca is great for energy too. Much better than M&Ms! A spoonful of raw honey with some coconut oil can provide a boost too and is one of my favorite quick energy snacks. I prefer this coconut oil. 4) Quick burst training. Got 10 minutes? Alternate sprints with walking (or just jogging depending on your fitness level) around the block for a great pick-me-up. 15 or 20 minutes is even better, and there’s your exercise for the day. 5) 10 minutes in the sun. Get some vitamin D and recharge. BONUS: do some deep breathing while you’re relaxing. Breathe in for 7 counts, out for 8 counts and repeat. 6) Herbs. Try adaptogenic herbs like licorice root (avoid if you have high blood pressure), rhodiola, ginseng, ashwaganda, or a combination. Gaia adrenal support strengthens tired adrenals for better energy long term. 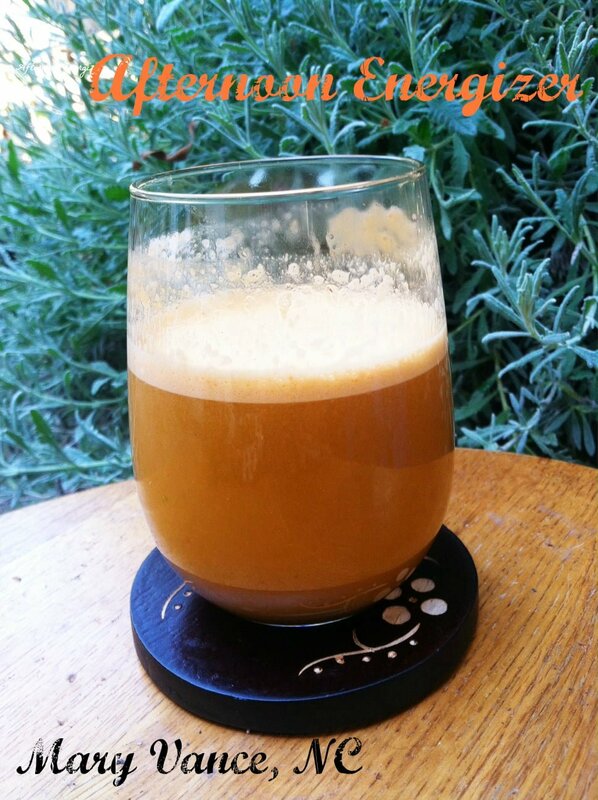 7) Try my afternoon energizer if you have a juicer or a juice shop nearby. If not, the green superfood mixes give you a great boost too. I like VitaMineral Greens and Amazing Grass. 8) Yoga. Do 10 sun salutations. 1. Too much coffee. Coffee will certainly give you a boost but can drain your energy later. 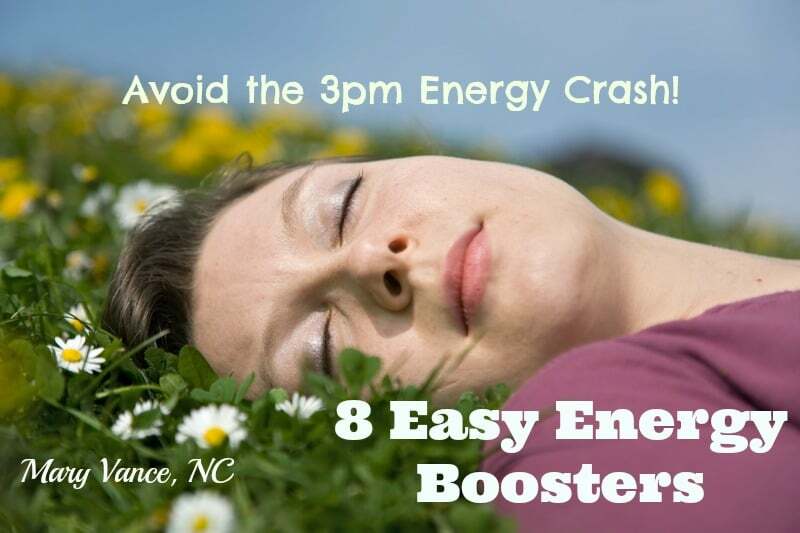 It contributes to unstable blood sugar and taxes your adrenals, leading to the dreaded 3pm crash. I have nothing against coffee if it doesn’t cause you side effects, or if you’re not addicted to it. But if you’re using coffee because you can’t drag yourself out of bed without it, it’s time to address the underlying cause. Click here for more about whether or not coffee is right for you. 2. Sugar. The refined, white stuff. We often crave sugar when we’re tired because it gives us a boost. Or if blood sugar is low, sugar cravings result, but what you really need is protein for energy/blood sugar stability. 3. Refined foods like white flour, cereal, snack foods, grain-based snacks. These break down quickly into sugar, which causes blood glucose spikes followed by crashes. What goes up must come down! Click here to listen to our podcast on healing and overcoming adrenal fatigue.